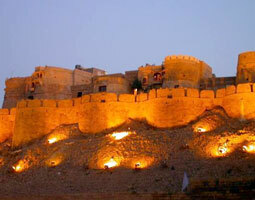 Bhavnagar, situated in Gujarat, is a prominent city known as the cultural capital of the state. The city is dotted with various beautiful attractions that win the heart the visitors. The footfall in the city includes both pilgrims and leisure travelers. The city is acclaimed for its proximity to beautiful Jain temples located in Palitana (51 km). These temples nestle on the top of the Shatrunjaya Hills, and count to about 863 temples. Thus, the destination witness pilgrims visiting the region round the year. The sheer number of temples amazes the visitors. Takhteshwar Temple in Bhavnagar is one of the major attractions for visitors coming from far flung regions. The list of major attractions also includes Aksharwadi Temple. Both the temples are praised for offering impressive view of the coast. Visitors can also make their trip memorable with a visit to the Nilambag Palace and Velavadar National Park (65 km).